The maroon van with yellow lettering displaying Wrangell Institute for Science and Environment (WISE) bounced down the McCarthy road on a beautiful day in July. A grey Bureau of Land Management (BLM) truck followed carrying additional gear and partner instructors. At the end of the road gear was checked, divided, and backpacks donned for the first mile trek across the bridge to Wrangell Mountains Center (WMC). We were greeted by friendly staff, McCarthy youth and adult participants, and a wonderful dinner of fresh garden salad, vegetable chili, rice, fruit, and brownies. The famous Kenny Lake Jan Carlson thank you song was taught and sung to the chefs and other instructors throughout the program. Twenty excited participants in the first Geology Backpacking partnership program (WISE, WMC, BLM, and National Park Service) got to know each other through questions, stories, jokes and metaphors. Evening lessons brought us the short distance to the shores of McCarthy Creek where we got a lesson on rocks from Barry Hecht and Mary Gianotti. We were split into pairs, instructed to each pick up two rocks that piqued our curiosity and share with our partner: something we noticed about it, what it reminded us of, and what it made us wonder about it. After sharing these thoughts we learned about the different kinds of rock – sedimentary, igneous, and metamorphic – how they were formed, and identified those we wondered about. The next morning gave promise to a beautiful day to back pack and commune with the glacial landscape and its icy core. After a hearty WMC breakfast of oatmeal, homemade granola, fruit, and coffee cakes we piled in the shuttle van to Kennecott. As we stood between towering red historic mining buildings above National Creek, we turned our bodies into glaciers carving miniature glacial landscapes in the gravel, labeling formations that added new words to our vocabulary: arête, erratic, cirque, headwall, esker, lateral and terminal moraines. After the lesson, scattering our miniature glacial landscapes, and having a picnic lunch we lifted our packs to our backs and headed for the Root Glacier. The trail was fairly flat traversing above the lateral moraine, skirting through spruce, small balsam poplar, willow and soapberry bushes. Spruce trees created window frame views of illusive ice covered in a river of grey gravel peaks flowing like rapids from the glacier tongue. After more than a mile of trekking, the trail began a steep decent to the camping spot above the glacier. After setting up camp, Park Service geologist, Mike Loso and WMC Board member and owner of Kennicott Wilderness Guides, Jared Steyaert joined us to be our guides and instructors for the glacier trek. We transformed our backpacks into day packs, stuffing them with extra warm coats, snacks, and crampons. A line of 22 of us snaked our way down the lateral moraine to the base of white glacier ice. There we paused and Jared gave instructions on strapping on crampons, demonstrated walking bull legged uphill and digging in straight downhill – all in slow stomping baby steps. Our expert guides gave us safety rules and then led us on an ice enchanted adventure. Melting ice carved waterfalls, creeks and rivers, cutting and gathering the ice into more water droplets. Day by day, swirling, dancing around and around, the artist sculpture carving deep blue holes called moulins into the bowels of the glacier. Drop after drop meeting to make a hidden massive under glacier water slide in perpetual motion. We filled our water bottles and drank this ancient pure water offered to us in deep blue moving pools and narrow channels. The massive headwall of the glacier rose like a kingdom as we walked in its outstretched hand. Bare mountain peaks stood amidst this icy kingdom. The adventure enveloped us with lessons, respect, silence, movement, peace, excitement, invigoration, and pause to contemplate and wonder. The glaciers demands put a strain on the legs and body, one that gave appreciation and respect for dynamic forces controlled by water. The next morning our new vocabulary and analogies were put to the test in a variation of charades. Three teams dubbed metamorphic, igneous, and sedimentary raced to get their team to guess the most terms, words, and metaphors. The active and fun lessons became cemented in our brains like metamorphic rock. The end of the journey took us back to Wrangell Mountains Center in McCarthy where we shared a last delicious meal, our thoughts of the experience, and how it might affect our future lives. WMC instructors and McCarthy participants graciously helped carry some of our gear the mile to the vehicles. In a new light the terminal moraine cast its forces upon us as we said our goodbyes to new friends and reflected on the camaraderie of shared exciting moments, solid as the rocks that formed over time. During the months of September and October, the Wrangell Mountains Center is hosting a series of blog posts about raptors in partnership with the NEA and Copper River Valley’s Big Read. This year’s Big Read book is the Maltese Falcon by Dashiell Hammett. So far we have explored raptors found in the Copper River Valley, falcons in particular, and what it is like to work with and rehabilitate raptors. This week we will take a deeper look into raptor migration and hear from Dr. Carol McIntyre, bird biologist for the National Park Service. Migration is defined as the seasonal movement of animals from one region to another. Many, but not all, of diurnal raptors migrate in the spring and the fall. They spend summer nesting and raising young in Alaska and travel to warmer climates during the winter. Raptor migration is not completely understood and people like Carol are studying it today. Scientists are working to understand how many birds migrate through a given area, which may indicate their population size, as well as where those birds go, and what factors influence migration. Since the Copper River watershed covers an immense area in eastern interior Alaska, a substantial number of migratory birds, including raptors, travel through the region in spring and fall. Carol notes that the Wrangell-St. Elias National Park and Preserve, and the Copper River Valley, are home to one of the largest migratory bird flyways in Alaska and perhaps North America. Raptor migration is an amazing event to witness: if you are in the right place on the right day you may be able to count hundreds of eagles and hawks flying overhead. Migrating diurnal raptors include Golden and Bald Eagles, Osprey, Northern Harriers, Sharp-shinned Hawks, Northern Goshawks, Red-tailed Hawks, Rough-legged Hawks, American Kestrels, Merlins, Peregrine Falcons, Gyrfalcons, and Swainson’s Hawks. You can learn more about these birds on Hawkwatch’s website. Carol’s recent work focuses on Golden Eagles. Tracking data for radio-tagged Golden Eagles indicate two broad Golden Eagle migration corridors in the Copper River Valley. One spanning the Mentasta Mountains south across the upper Copper River Valley to the northern slopes of the Wrangell Mountains; and a second spanning from the southern slopes of the Wrangell Mountains south across the Chitina River to the northern slopes of the Chugach. Carol said that they decided to count eagles in the Mentasta Mountains because she had data showing that many eagles from Denali travel through that region in the spring and fall, and that local birders had witnessed amazing numbers of eagles traveling though the area in early March. 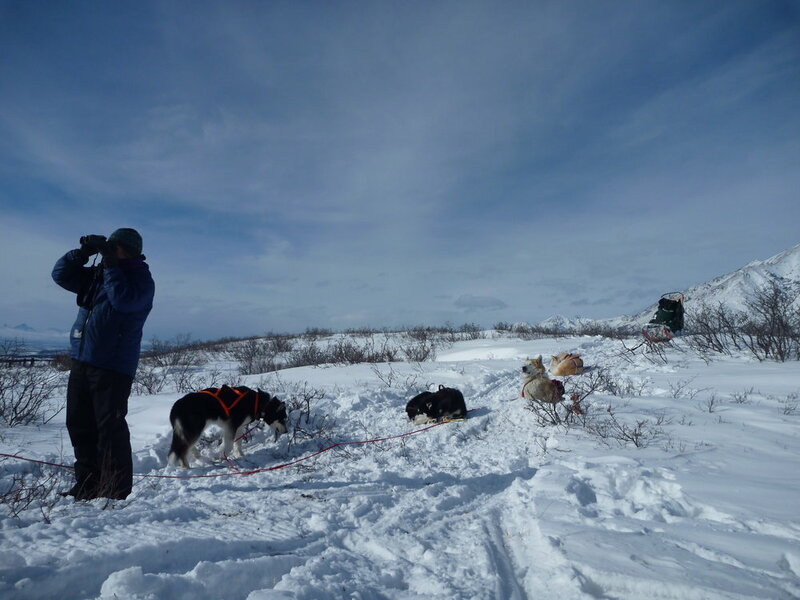 Carol and her husband spent their spring vacation in March 2014 traveling around the Mentasta Mountains by dog sled, camping out, and staying put for periods of time to count birds. Carol McIntyre and her colleague at the US Fish and Wildlife Service, Stephen Lewis, recently published a study in the Journal of Raptor Research documenting large numbers of Golden Eagles migrating through the Mentasta Mountains in both spring and fall. In October 2014, during 39.5 hours of counting, they measured 1364 migrating eagles, as well as a number of other migrating raptors including 525 Rough-Legged Hawks. McIntyre and Lewis note that there is not very much ecological and demographic information about most species of raptors nesting in interior and northern Alaska. Studies and counts, like the one just published, suggest that there are probably more migratory birds than previously thought. The paper notes that Alaska’s migratory Golden Eagles cross many ecological and political boundaries during their annual cycle. As the landscape around us changes it is important to understand how populations of migrating birds are affected. Studies like this are the first step, but there is a lot more to be learned. You can read the full article by McIntyre and Lewis in the Journal of Raptor Research here. You can see raptors migrating through the Copper River Basin in the autumn when they are heading south from early September – late October, and in Spring from mid March – late May. Another great place to watch raptor migration is at Gunsight Mountain on the Glenn Highway. During the months of September and October, the Wrangell Mountains Center is hosting a series of blog posts about raptors in partnership with the NEA and Copper River Valley’s Big Read. This year’s Big Read book is the Maltese Falcon by Dashiell Hammett. In the first two posts of this series we explored a bit about what types of raptors are found in the region and looked a little bit closer at falcons in particular. This week I talked with Nancy Wade at the Alaska Wildbird Rehabilitation Center (AWBRC) to learn more about what it is like to work with raptors. AWBRC is a nonprofit whose mission is to care for injured, orphaned and sick wild birds with the goal of returning them to the wild; and to educate the public about these birds and their habitats. They do this by rescuing birds in need, as well as providing educational programs with live, non-releasable raptors. They visit numerous schools, tourist venues, public events and private parties, including Earth Discovery Day hosted by WISE and a number of partner organizations each spring in Copper Center. Nancy has been working with AWBRC for the past 10 years and started out by volunteering one shift a week caring for the birds. From there she learned how to become an education bird presenter and is now the educational curator. Nancy says that “it is very interesting, fun, and satisfying being around these wild birds. They are still wild, despite their comfort around humans. They are amazing”. I asked her more about what the rehabilitation process is like. Nancy says it varies widely from simply allowing a stunned bird to regain its composure to surgery for broken bones. AWBRC has a veterinarian who volunteers to perform surgeries, set bones, and supervise injured bird care. Most of the injuries are somehow human caused, including car hits, window hits, and cat or dog bites. Currently the AWBRC has nine raptor education ambassador birds (birds that are not fit to be released into the wild and are used for educational programs). One recent arrival is a Northern Saw-whet Owl. The saw-whet is the smallest owl in this area of the state, and she is an incredibly cute and energetic addition to the team. She was rescued as a chick with a bad eye infection. During her care it was found she also has respiratory difficulties. Because of this, the vets determined that she could not be released and survive in the wild, as she would have trouble flying well enough to hunt. She lives in an 8' x 8' mew, or cage, built of wood with partially open slatted walls. This gives her enough room to fly and exercise, and get sunlight and fresh air. Several times a week her handling gear (jesses and a leash) is put on her, and she is taken out on hand to keep her comfortable with her human companions. She has been requested frequently to meet the public in education programs. Her food, as in the wild, is small, usually frozen mice and quail purchased from a reputable source. Raptors have sharp beaks and talons so the educational birds have them trimmed for the safety of the handlers and birds. Nancy says that watching the birds eat makes her realize that raptors are supremely designed for their place in nature as hunters. Short-eared Owl. Photo courtesy of AWBRC. If you find an injured wild bird, the first thing to is to get them out of the way of further harm, as long as it is safe to do so. Then call a bird rehabilitation center, so they can direct you to the next steps. A small bird can be placed in a box away from pets and kids. Then call a bird rehabilitation center. We can direct on the next steps. Baby birds can sometimes be returned to the nest, and a bird that gently hits a window may just need an hour or so in a safe place to get over the bump. You can learn more about AWBRC on their website. Thank you so much to Nancy Wade for sharing her experience working with wild raptors. During the months of September and October, the Wrangell Mountains Center is hosting a series of blog posts about raptors in partnership with the NEA and Copper River Valley’s Big Read. This year’s Big Read book is the Maltese Falcon by Dashiell Hammett. You can read the first post about raptors in Alaska here. The falcon, as a bird of prey, may be an important symbol in the 1929 detective novel, the Maltese Falcon, indeed it is named in the title and many make references to the similarities between falcons and falcon hunters and the book’s main character, Sam Spade. Many people may think of falcons as ruthless, bloodthirsty hunters (and this may be why they are used as a symbol in literature), but they are also beautiful birds and graceful aerialists that usually only hunt out of necessity. There are four types of falcons in Alaska: the American Kestrel is the smallest (about the size of a robin), the Merlin (which is smaller than a pigeon), the Peregrine Falcon (which is crow-sized) and the Gyrfalcon, which is the largest (about the size of a raven). Except for the Gyrfalcon, which is usually a year-round resident, and some sub-species of Peregrines, most falcons migrate, sometimes all the way down to South America during the winter. Since falcons are such amazing hunters, people have worked with them for thousands of years, training the birds to hunt with people. Falconry is the sport of pursuing, capturing, or killing game using a trained raptor and is a lawful method of hunting and practiced in Alaska. To read more about people practicing falconry today check out this article from 2010 in the Alaska News Miner. To learn more about the natural history of falcons in Alaska, read this handout published by the Alaska Department of Fish and Game. The Wrangell Mountains Center is hosting a series of blog posts about raptors in partnership with the NEA and Copper River Valley’s Big Read. This year’s Big Read book is the Maltese Falcon by Dashiell Hammett. You can learn more about Big Read Events online here. For this first entry, we are going to discuss what raptors are, what they look like, and what types of raptors you might see flying over the Copper Valley. The term “raptor” describes a bird of prey, which includes hawks, falcons, and owls. Raptors have three characteristics: excellent eyesight, sharp talons, and a hooked bill. A way to tell raptors apart is to look at the shape of their silhouettes when they are flying. Eagles are large with wingspans up to 7 feet. They are buteos, or “soaring hawks” which have long, broad wings and short tails. Other examples of buteos include the Red-tailed hawk and Swainson’s hawk. Accipiters have short, rounded wings and long, rudder-like tails. They are bird-eating specialists and can maneuver around trees in the forest. Examples include the Goshawk and Sharp-shinned hawk. Falcons have long, narrow, pointed wings and are fast flyers. Examples include the Merlin and the American kestrel. You can download the coloring page below which includes many of the raptors you might spot soaring over the Copper Valley. Also check out the Bird Checklist for the Wrangell-St. Elias National Park to learn more about birds in the area. It’s the season for rhubarb! The huge leaves may be poisonous, but the beautiful red stems are delicious in pies, jams, crisps, and compotes. Try it paired with strawberries and flavored with orange zest. We’ve got a healthy crop this year! Beets are here! One of the most multipurpose vegetables, they are delicious in both sweet and savory dishes. Steam, roast, sauté, or can the root. Or use beet purée in a cake. Did you know beets were the secret ingredient in the original red velvet cakes? And don’t forget the leaves! Beets are closely related to chard and their leaves share the delicious flavor. Our lettuce is thriving in this week’s rain. The gigantic heads have incredibly delicate leaves, and not a single one has bolted! Have you ever tried the “flashy trout back” variety? Come by to see for yourself or visit us at McCarthy’s farmers’ market on Saturday afternoon.